During toddlerhood your toddler continues to grow faster than any other time of life, growth at this rate will never be repeated again in your toddler’s life! 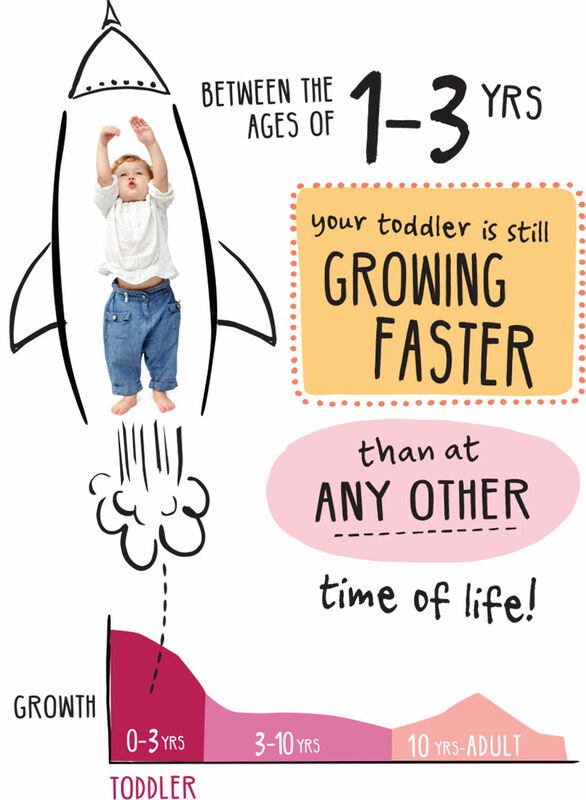 Watch out Mum and Dad as your toddler’s height is ‘rocketing’ *by two years of age your little toddler will have grown to be approximately half his or her adult height. Your toddler has unique nutritional requirements to support this period of growth and development. However despite this, your toddler’s tummy is only the same size as his or her own clenched fist, so every spoonful counts. During toddlerhood growth and development are not the only transitions for your toddler, during this time your toddler will also be developing his or her personality and independence which is normal and can be great fun but also bring its challenges. Try to remain relaxed and enjoy the amazing journey of toddlerhood. *Based on a prediction for height, a child’s height is influenced by genetics. Please note that children grow at different rates.